Not that you'd expect to see the following statement in any decor blog, but Lincoln is hotter than ever! Seriously though, Abraham Lincoln has been the center of attention since President Obama made his historic inaugural train trip into Washington DC, emulating the same route that Lincoln himself took from their shared home state 150 years ago. The connection clearly isn't as superficial as the train ride; Lincoln freed the salves, and Barack Obama as an African-American President is the epitome of those slaves' dreams fulfilled. Lincoln may arguably be the most important American President, but apart from that he was a visually striking man. Of course, his extreme height and slender frame gave him the immediate presence that most politicians envy. But it was Lincoln's eyes, in particular his heavy eyelids, that serve to personify his look. It's this exact look we were attempting to capture in the Abraham Lincoln Wallpaper shown above. 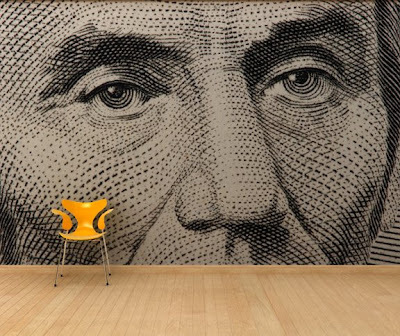 The "Lincolnwall" wallpaper is well-suited as a wall mural, but could easily be reduced in size to accommodate a smaller wall space above a chair rail or wainscoting. The striking features of Lincoln are represented in the wallpaper design with dramatic line work reminiscent of lithographs. The bold lines maintain center stage as the background color is simple and muted. This design is not yet featured on our website, but feel free to contact us to inquire about the Lincoln wallpaper. As President Obama was inspired by Lincoln's famous train ride into Washington, you can now paper your walls with that same source of inspiration as well.